Tasty Sweet Chili Shrimp Recipe. An easy shrimp recipe using simple ingredients. I marinade the shrimp for at least 30 minutes in the refrigerator to boost the flavor. I bought the shrimp with shells removed to make it easier to prep and less time to clean. Sweet chili sauce comes in different varieties and brands. You may want to adjust the sweetness and saltiness according to your liking during the cooking process. 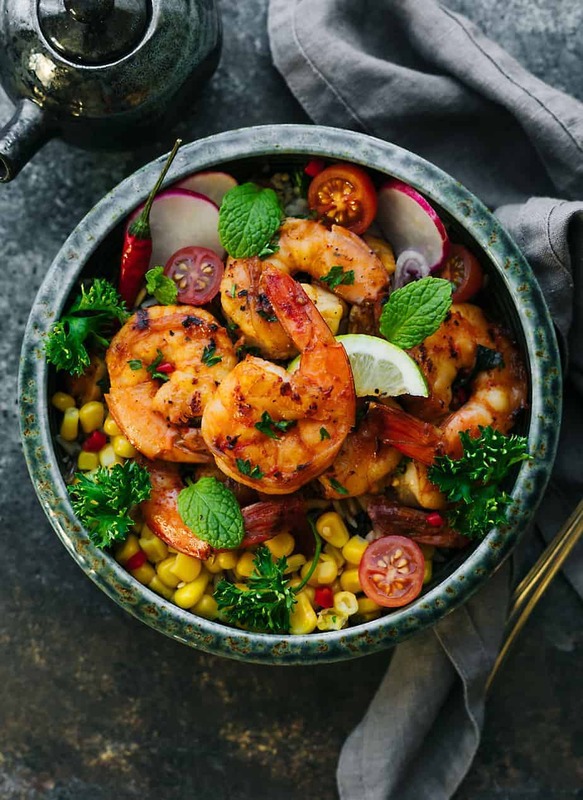 And even though this sweet chili shrimp recipe uses the sauce as one of main ingredients, it is not considered as a spicy dish. You may add some fresh red chili pepper or cayenne if you like to add spiciness to this shrimp dish. Shrimp both raw and cooked, should feel firm and smell sweet. Avoid any with an ammoniated odor. If you are buying frozen shrimp, be sure they have not been thawed more than one or two days. Uncooked shrimp should be refrigerated immediately and cooed as soon as possible. Have a leftover cooked shrimp? You can refrigerated for up to three days. Are you only finding shrimp with shells at your market? No problem, just remove the shells and cook them in boiling water before you throw in the garbage as that can reduce the stinky smell. 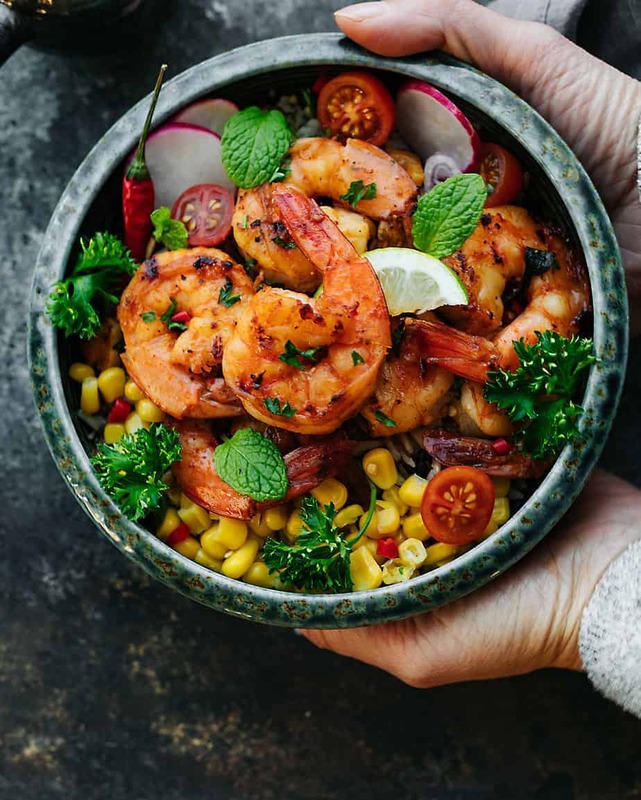 Serve this sweet chili shrimp recipe with coconut rice, some fresh vegetables like corn, peas, tomatoes or any vegetables of your choice. In a large mixing bowl, marinate the shrimp with garlic, ginger, olive oil, sweet chili sauce, white wine vinegar, basil, salt and paprika. Mix well and refrigerate for 30 minutes. Cook shrimp for about 2-3 minutes on each side or until cooked. Serve with rice, corn, mint and veggies of your choice. Those sound amazing! I love to mix sweet and spicy together, especially with shellfish. I can’t wait to try this recipe. wow, that dish looks amazing! if only I could eat the now : ) I’ll have to share this with a few people I know that would love to try this recipe out! Your food always makes me salivate and they are very healthy too. I love seafood but have never tried preparing it this way. Oh my goodness! This recipe is really fantastic and can’t wait to make it this week! I’m totally craving fro this. This looks not only like a yummy meal but it is so pretty I could print it out and hang it on my wall. Great job on this photo, so cool! I don’t do shrimp, but if I did!! I love how colorful the bowl is! I am typically intimidated by cooking shrimp since I don’t know what to do with it. This recipe looks like something I can make and would be a big hit with my family. This looks pretty awesome! I don’t eat shrimp often, but I might make an exception for this! Oh my I love everything with Shrimp. Living on South Texas we always have access to fresh shrimp.This would be wonderful! This looks delicious, I love the sweet and spicy combination. Normally I try all your recipes but have to pass on this one, as I can’t eat shellfish. That looks good enough to make me overlook how much I don’t like shrimp…almost. Oh my gosh – that looks like an amazing dish! I love shrimp and would love to try making this sometime! This dish looks divine! I love all the freshness and flavors in it – can’t wait to try making it! I don’t eat shrimp near enough and I’ve got to change that. I love how colorful and delicious this recipe looks. I love coming here and looking at your food. This is mouth watering! I can’t wait to try this. Shrimp is my weakness! This looks absolutely amazing and my mouth is watering! We love seafood over here and I can’t wait to try this. And thanks for the tip in regards to the shell. I’ll do just that!